The summer I got married, a bunch of my friends were living in a rental on Plum Street in Fort Collins. None of them were college students at the time, but this was a classic college student rental house- old, near campus, big trees, but unkempt. I was over one day, eating a carrot, and got to the stem end of it. I looked around for a compost bucket on the counter, because I knew Pat Daly had had a compost pile at his old house. I asked him, and he took the end of carrot out of my hand and opened the back door and hucked it out into the bushes. I must have looked a little surprised. “Have you read One Straw Revolution?” he asked. “Masanobu Fukuoka,” he pronounced carefully. “He’s this Japanese guy who says don’t plow, or turn the soil, just plant everything in mulch, and use everything to mulch with, instead of big compost piles.” That was his summary of the philosophy- mulch everything, and anything can be mulch. There’s probably more to it than that. I thought about Pat Daly and his Fukuoka experiments earlier this summer when I noticed a sprout growing next to my back door- when it was little, it was hard to tell if it was a cucumber or sqaush- they look alike to me. I didn’t pull it, even though I didn’t technically plant it. Sometime last fall when I was emptying the compost bucket, I was too lazy to walk out to the bin. Maybe it was snowing, or just dark, or…honestly, I don’t remember. Seeds got dumped in amongst the leaves by the veggie bed, and one sprouted this spring. A month or so later, the plant was growing into the path, so I turned it 180 degrees, and now it’s growing behind the bed towards the house. 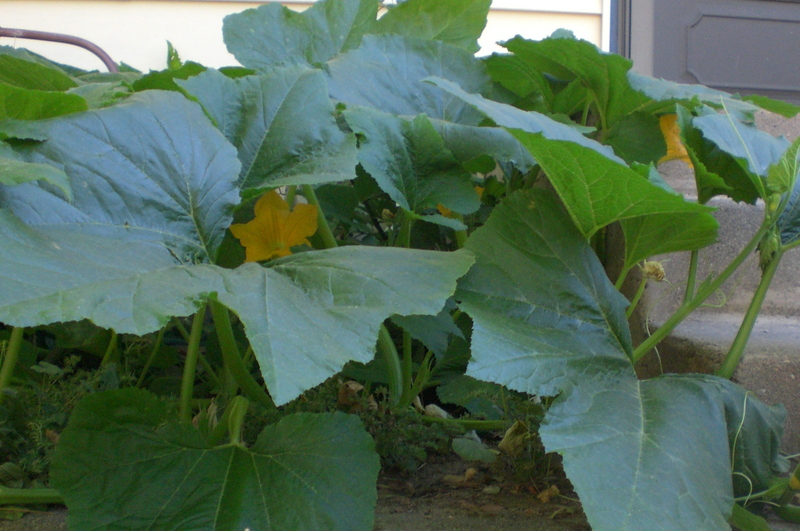 Maybe it’s a weed, but free squash is good squash. What kind of squash? Who knows? What is it? We got a lot of different squashes from our CSA last year www.grantfarms.com pie pumpkin, decorator pumpkin, gourd, acorn squash, weird lumpy green ones that tasted really good but made the pie look like baby poop…It could be any of them, or a cross. 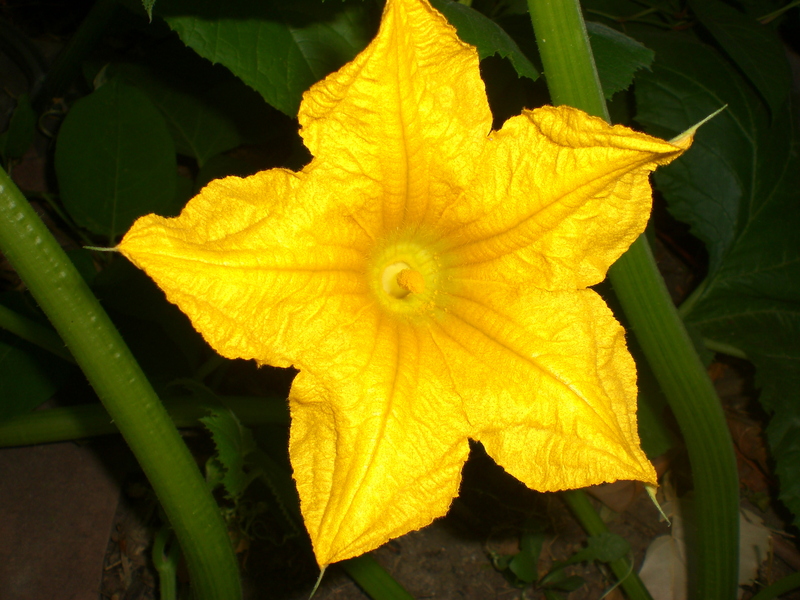 There were male blooms, and just now, female blooms with fruits growing behind them. Still unidentifiable. I have my fingers crossed for a bumper crop of mystery gourds. We’ll just call them Fukuoka pumpkins. Slight digression- one of my favorite sites on the interwebs is One Straw www.onestraw.wordpress.com the saga of a suburban guy who is turning his lawn into a microfarm. There’s a man who knows the value of mulch.